Botswana is well known for having some of the best wilderness and wildlife areas on the African continent. With a full 38 percent of its total land area devoted to national parks, reserves and wildlife management areas � for the most part unfenced, allowing animals to roam wild and free � travel through many parts of the country has the feeling of moving through an immense Nature wonderland. Botswana is a rarity in our overpopulated, over-developed world. Untamed and untameable, it is one of the last great refuges for Nature�s magnificent pageantry of life. Experience here the stunning beauty of the world�s largest intact inland Delta � the Okavango; the unimaginable vastness of the world�s second largest game reserve � the Central Kalahari Game Reserve; the isolation and other-worldliness of the Makgadikgadi � uninhabited pans the size of Portugal; and the astoundingly prolific wildlife of the Chobe National Park. Botswana is the last stronghold for a number of endangered bird and mammal species, including Wild Dog, Cheetah, Brown Hyena, Cape Vulture, Wattled Crane, Kori Bustard, and Pel�s Fishing Owl. 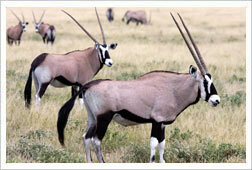 This makes your safari experience even more memorable, and at times you will feel simply surrounded by wild animals. The first � and most lasting impressions � will be of vast expanses of uninhabited wilderness stretching from horizon to horizon, the sensation of limitless space, astoundingly rich wildlife and bird viewing, night skies littered with stars and heavenly bodies of an unimaginable brilliance, and stunning sunsets of unearthly beauty. As well, with more and more cultural tourism options on offer, you will be charmed by the people of Botswana, visiting their villages and experiencing first-hand their rich cultural heritage. But perhaps most of all, Botswana�s greatest gift is its ability to put us in touch with our natural selves. It offers that vital link so keenly felt by inhabitants of the developed world, a pervasive void we feel but often cannot name � our connectedness with Nature and the astonishing diversity of plants and animals to be explored. Location: Botswana is a land-locked country situated in southern Africa. It borders South Africa, Namibia, Zambia and Zimbabwe. Approximately two-thirds of the country lies within the Tropics. Country Size: Botswana covers an area of 581 730 square kilometres � about the size of France or Kenya. Topography: Most of the country is flat, with some small hills in the eastern areas. Kalahari sands cover 84 percent of the surface area. With the exception of the northern areas, most of Botswana is without perennial surface water. One of the most sought after wilderness destinations in the world, the Okavango Delta gives entrance to the spectacle of wild Africa such as dreams are made of � the heart-stopping excitement of big game viewing, the supreme tranquility and serenity of an untouched delta, and evocative scenes of extraordinary natural beauty. A journey to the Okavango Delta � deep into Africa�s untouched interior � is like no other. Moving from wetland to dryland � traversing the meandering palm and papyrus fringed waterways, passing palm-fringed islands, and thick woodland, resplendent with lush vegetation, and rich in wildlife � reveals the many facets of this unique ecosystem, the largest intact inland delta in the world. The Okavango Delta is situated deep within the Kalahari Basin, and is often referred to as the �jewel� of the Kalahari. That the Okavango exists at all � deep within this thirstland � seems remarkable. Shaped like a fan, the Delta is fed by the Okavango River, the third largest in southern Africa. It has been steadily developed over the millennia by millions of tonnes of sand carried down the river from Angola. Swollen with floodwaters from the summer rains, the Okavango River travels from the Angolan highlands, crosses into Botswana at Mohembo in the Caprivi, then later spills over the vast, fan-shaped Delta. The timing of the floods is uncanny. Just as the waters from Botswana�s summer rains disappear (April, May), so the floodwaters begin their journey � 1300 kilometres of which is through Kalahari sands � revitalising a vast and remarkably diverse ecosystem of plant and animal life. The water�s flow, distribution and drainage patterns are continually changing, principally due to tectonic activity underground. As an extension of Africa�s Great Rift Valley, the Okavango is set within a geographi-cally unstable area of faults, and regularly experiences land movements, tremors and minor quakes. By the time the water reaches Maun, at the Delta�s southern fringes, its volume is a fraction of what it was. As little as two to three percent of the water reaches the Thamalakane River in Maun, over 95 percent lost to evapo-transpiration. But the flow doesn�t stop in Maun. It may continue east to the Boteti River, to fill Lake Xau or the Makgadikgadi Pans, or drain west to Lake River to fill Lake Ngami. Covering a full 84 percent of Botswana�s land area, the semi-arid Kgalagadi terrain dominates most of the country. Refuting the classical perception of desert as a barren, vegetation-less, useless land, the Kgalagadi (Kalahari) is rich in natural resources. These include its sweeping grasslands that feed not only its wildlife populations, but also its swelling cattle herds (numbering approximately 2 million), thus supporting the country�s third largest industry - cattle ranching, and its mineral wealth, namely diamonds, which have fostered and sustained dramatic economic growth for the past 35 years. A land of singular, often hidden, beauty, the Kgalagadi is intensely alive with an astonishing diversity of plant and animal life. It has broad variations in vegetation, supporting several savanna types, namely grass, shrub and tree savanna. The Kgalagadi landscape often appears as grassy plains dotted with low shrubs, interspersed with trees or belts of trees, which often stand on sandy ridges. Though a newcomer�s first impression may be one of �sameness,� there are subtle topographical interruptions to the desert�s essentially flat surface, including channels, fossil valleys, dune features and pan depressions. Following a season of good rain, the desert is transformed, covered with lush, green grasses, and flooded pans � a source of rebirth and rejuvenation for both humans and animals. The Kgalagadi is essentially a basin into which sediments have continually been deposited and covered with sand. It is a region of great ecological, vegetative, geomorphological and climatic diversity. At its northern reaches (gabon, Congo and Zaire), the Kgalagadi lies in the humid tropics and is dominated by parts of the Congo drainage system. At its core, in Botswana and neighbouring countries (South Africa, Namibia, Zambia, Zimbabwe and Angola), it is an arid to semi-arid region with little surface water. 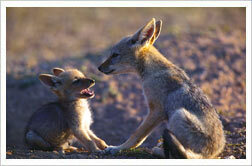 The Kgalagadi is the largest continuous area of sand on earth, touching nine African countries. With an approximate area of 2.5 million sq kms, it extends through 30 degrees of latitude and embraces several ecological zones. Human occupation of the Kgalagadi goes as far back as the Early Stone age. Its Middle Stone age inhabitants, the San, developed survival strategies superbly adapted to � and in harmony with - their environment, masterfully extracting food resources from both the land and animals. Today, settlements, including cattle farms, dot many areas of the desert. 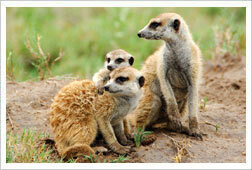 Five game reserves and national parks have been set aside in Botswana�s vast share of the Kgalagadi. These are: Central Kalahari game Reserve, Khutse game Reserve, Makgadikgadi pans game Reserve, Nxai Pan National Park, and the Kgalagadi Transfrontier Park. All are remotely situated, separated by vast distances; and for many visitors, the sensation of unending space and pure isolation are the principle destinations. Spectacular landscapes, rich and varied wildlife, and a host of historical, cultural and natural history attractions define this unique and very striking corner of northeastern Botswana. Straddling the Shashe, Motloutse and Limpopo Rivers, which serve as natural boundaries with Zimbabwe and South Africa, the Northern Tuli Game Reserve (NTGR) comprises 71,000 hectares of remarkably diverse habitat, including mophane bushland, riverine woodland, and marshland, punctuated by towering sandstone cliffs, basalt formations and unusually shaped kopjes � making for truly breathtaking scenery. One of the largest privately owned game reserves in Southern Africa and incorporating three major private concessions (Tuli Safari Lodge, Nitani Private Game Reserve, and Mashatu Game Reserve), the NTGR is home to 48 species of mammals and over 350 species of birds, with an estimated 20 000 animals residing in the reserve. Most naturally occurring wildlife species are present, includingelephant, kudu, zebra, impala, duiker, wildebeest, waterbuck, steenbok, and warthog. Large herds of eland � often not seen elsewhere in Botswana � are present, and these are indeed an awesome sight. All major predators, including lion, leopard, cheetah and hyena, are present, and the birdlife is prolific. The NTGR is adjacent to a larger area of eastern Botswana called the Tuli Block. This is a ten kilometre wide strip of land running approximately Northern Tuli Game Reserve 180 kilometres south to Martin�s Drift that holds a string of commercial agricultural and game farms, several of which also offer tourist facilities. 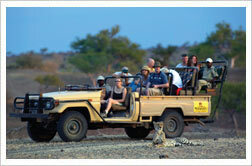 Travellers keen for a more active safari experience will delight in all there is on offer. You can hike the reserve, bike the reserve, horse-ride the reserve, and even hot air balloon the reserve! At Mashatu Game Reserve, guests can accompany elephant or predator researchers, to gain first-hand insights into the behaviour, feeding habits, territories, demography, and social structure of these animals, as well as critical wildlife conservation issues. A similar experience awaits guests at Nitani � as they come to understand the complexities of a long-term hyena research project. Molema Bush Camp, a community based tourism project managed and operated by Tuli Safari Lodge, is an ideal way to take part in a tourism concept that is rapidly gaining momentum in Africa. Local communities become active partners in tourism projects, from which they can more readily see clear-cut financial and social benefits. Molema is a joint venture between three local villages: Motlhabaneng, Lentswe le Moriti and Mathathane and two tour operators: Tuli Safari Lodge and Talana Farms. Archaeological sites provide an important historical perspective to the region. Iron Age sites demonstrate the formidable skills in pottery, mining, and smelting of the Zhizo, Leopard�s Kopje and Mapungubwe peoples, who practised agriculture and animal husbandry in the area. Artifacts from the Mapungubwe Kingdom (1220-1290AD), a precursor to the Great Zimbabwe civilisation, reveal the sophistication of the technology and society of its people, and their extensive trade networks. The NTGR will form the heart of the proposed Shashe/Limpopo Trans- Frontier Conservation Area (TFCA), its signatories � Botswana, Zimbabwe and South Africa � agreeing to cooperate to conserve and manage shared natural resources. Rich in biodiversity, the proposed TFCA will cover approximately 4,872 square kilometres and will be one of the largest wildlife conservation areas in Southern Africa. Once proudly referred to as �Africa�s fastest growing city,� Botswana�s capital, Gaborone, has been � since its inception � continually expanding, to the point that now the sprawling urban centre of some 300 000 residents has become nearly unrecognisable from the tiny, dusty administrative town it was at the country�s independence in 1966. What makes Gaborone so unique, however, is that the visitor can enjoy all the familiar modern conveniences of home, but can gain entry into rural Africa, or wildlife areas, within minutes � having then the best of both possible worlds.